The arrival of almost 120 pieces of nineteenth-century Kentucky furniture, silver, ceramics, textiles, paintings, and works on paper. This extraordinary trove of great Kentucky art was given to the Speed by Bob and Norma Noe. The Noes, both Kentucky natives, assembled the collection over the course of thirty years. Their generous gift makes the Speed’s Kentucky collection the best in the country. Over sixty highlights from the collection are now on view in the exhibition, Kentucky Antiques from the Noe Collection: A Gift to the Commonwealth. If you want to hear Bob Noe talk about his experiences as a collector, check out this and this. To learn more about the Noes’ gift, read the whole press release. The Kentucky Online Arts Resource, a project of the Speed Art Museum, is pleased to add the Kentucky Historical Society to the site’s growing list of museum partners! KOAR now features several highlights from Kentucky Historical Society’s exhibition, Great Revivals: Kentucky Decorative Arts Treasures. Curated by Estill Curtis Pennington, the exhibition brings many of KHS’s best pieces together in a single installation at the Old State Capitol in Frankfort. 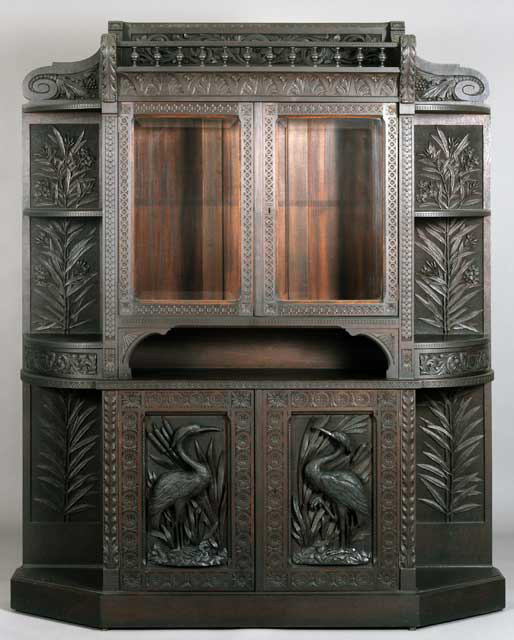 Among my favorites: a terrific example of “art-carved” furniture with carved decoration by Kate Perry Mosher of Covington, Kentucky (located just across the river from Cincinnati). I first saw this cabinet several years ago in one of KHS’s storage areas and was blown away the quality of Mosher’s work. Her carvings of herons, Kentucky cane plants, and other plant forms reflect great skill and a great eye for design. Mosher learned from a master: Cincinnati’s Benn Pitman, the godfather of Cincinnati’s late nineteenth-century art-carved furniture movement. 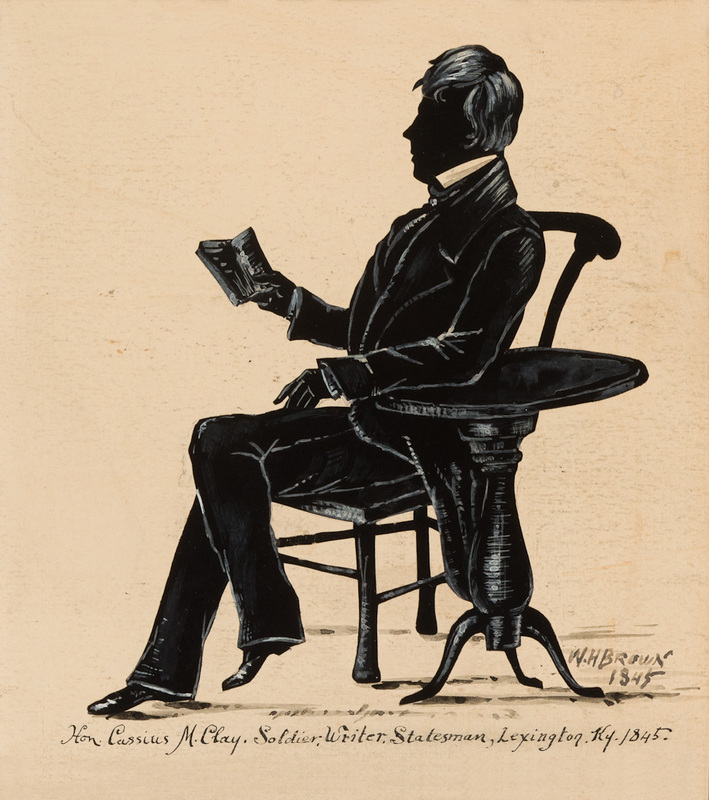 Pitman established a wood carving program at the Art Academy of Cincinnati in 1873. Like Mosher, many students of art carving were women. She ranked among the best, exhibiting her work at the 1876 Centennial Exposition in Philadelphia and at the World’s Columbian Exposition in Chicago in 1893. 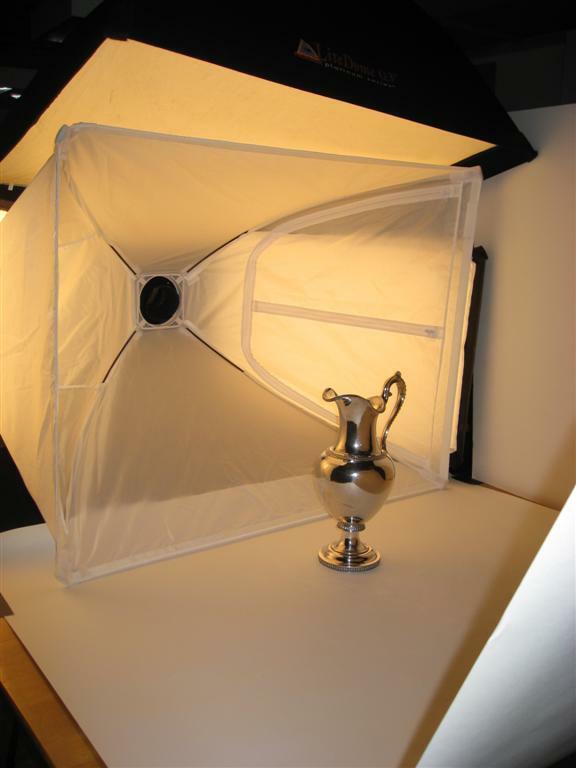 I’m pleased to announce the opening of Silver in Kentucky, 1800-1860, a new installation at Louisville’s Speed Art Museum. 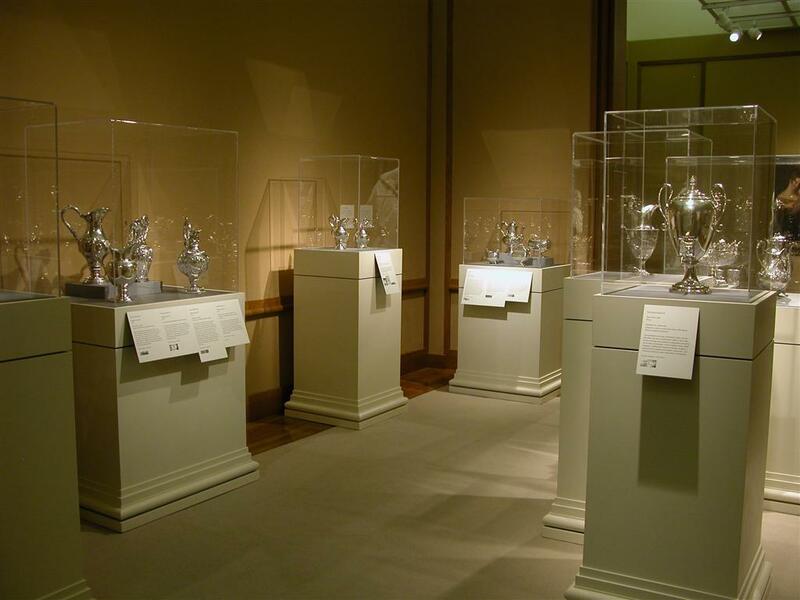 The exhibition features over twenty-five outstanding examples of silver hollowware, including pitchers, tea sets, and other forms. All come from the state’s finest private collection of Kentucky silver. 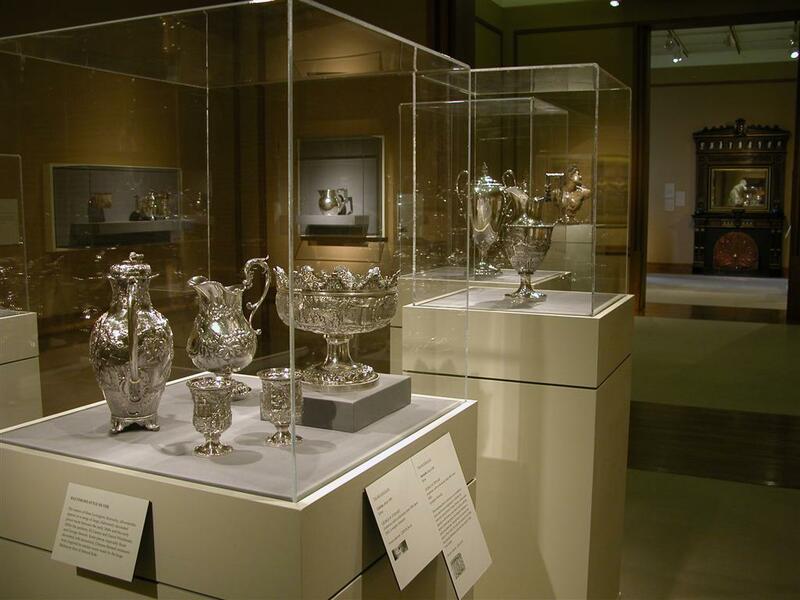 Along with the work of well-known Kentucky silversmiths like Asa Blanchard (about 1770-1838), the exhibition also includes pieces by less familiar makers like Charles Plimpton (working from at least 1814). 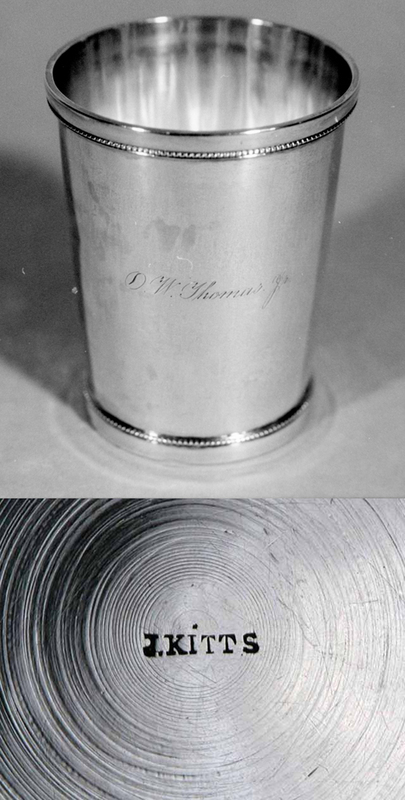 Judging by period advertisements, Plimpton was more active in Lexington as a “silver plater” than as a silversmith, perhaps explaining the relative scarcity of silver pieces with his mark. Other highlights include: an extremely rare coffee or hot water urn bearing the mark of Lexington’s George Stewart (active in Kentucky from about 1857 until about 1864), a Stewart horse racing trophy for the 1846 Chiles Stake, and an Asa Blanchard teapot that retains an old, and perhaps original, cloth strainer bag mounted on a silver collar. 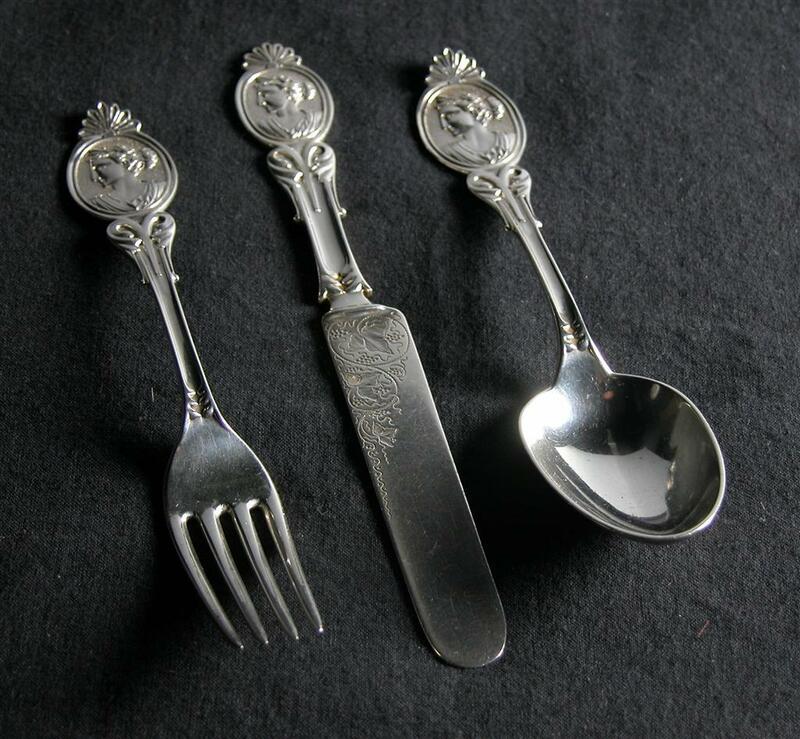 Since at least the 1920s and likely much earlier, collectors of early Kentucky antiques have loved the work of the state’s early silversmiths. Kentucky silver is beautiful and less perplexing than furniture. 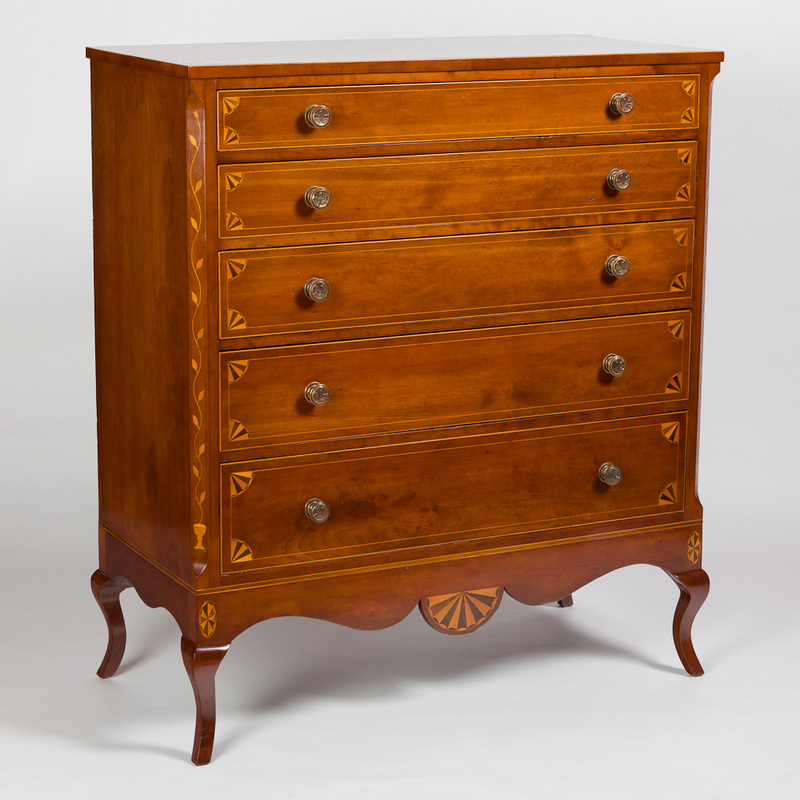 Kentucky furniture, with some exceptions, is often mute–pieces can’t be tied to specific cabinetmakers. 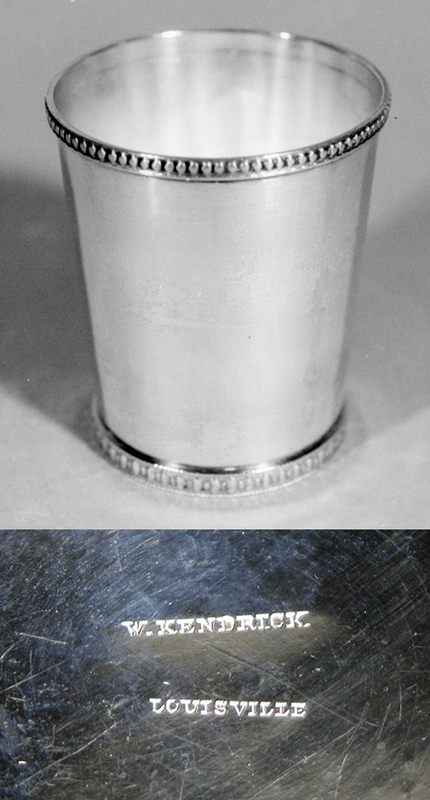 Silver, though, was typically marked by its maker. 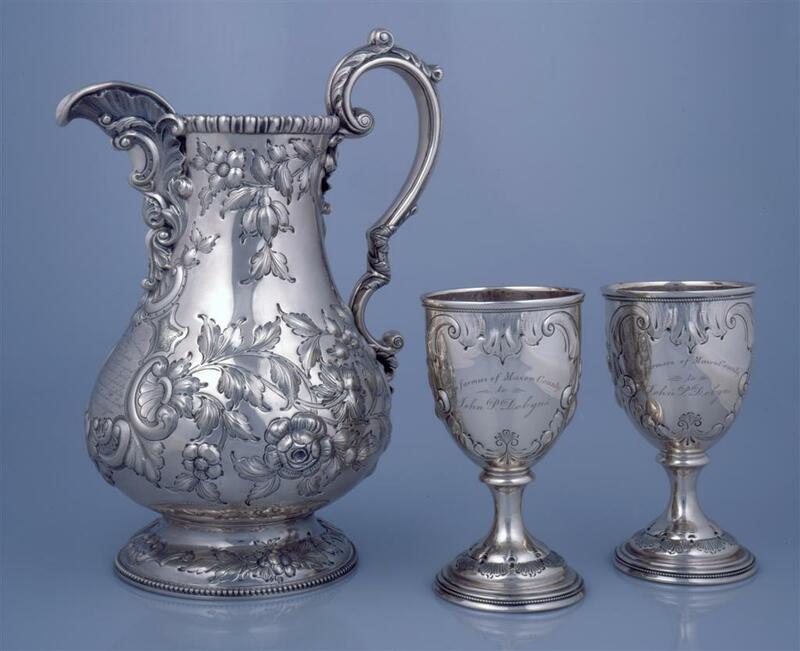 The pitcher and goblets, among my favorite examples of “sort of” Kentucky silver, were presented around 1850 to John Dobyns by “the farmers of Mason County.” Dobyns was a prominent merchant and entrepreneur. Both the pitcher and goblets bear the mark “E. & D. KINSEY” for Edward and David Kinsey of Cincinnati. The Kinsey brothers wholesaled a great deal of silver in Kentucky through retailers in the state, so one isn’t surprised to see their mark on a piece associated with Kentucky. But the story here is more complicated. The pitcher is identical to one retailed around the same time by Tiffany and Company in New York City and was no doubt made in New York City. So here we have “sort of” Kentucky silver times two: made in New York City, acquired wholesale by the Kinseys, marked by them, and presented to a Kentuckian. This pitcher, presented as an agricultural fair premium (prize) in 1859, bears the mark of John Akin, a jeweler who operated in Danville in Boyle County, Kentucky. 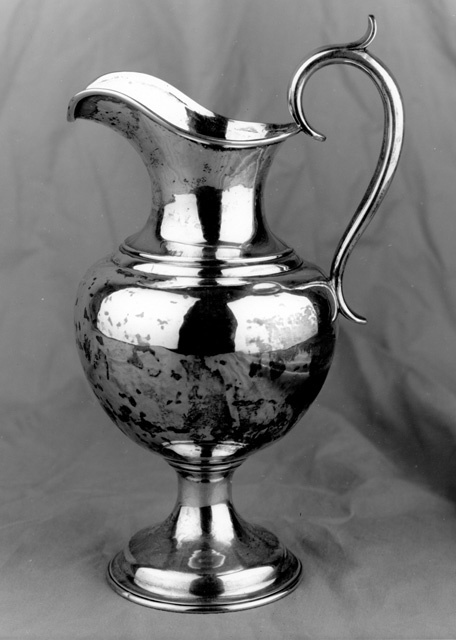 Many of the hollowware pieces with Akin’s mark, though, also bear the mark of Peter Krider, a Philadelphia silversmith whose firm produced silver in fairly substantial quantities. Philadelphia merchants had strong business ties to Kentucky. The Lexington silversmith Asa Blanchard, for example, traded with Hildeburn and Woolworth in Philadelphia. 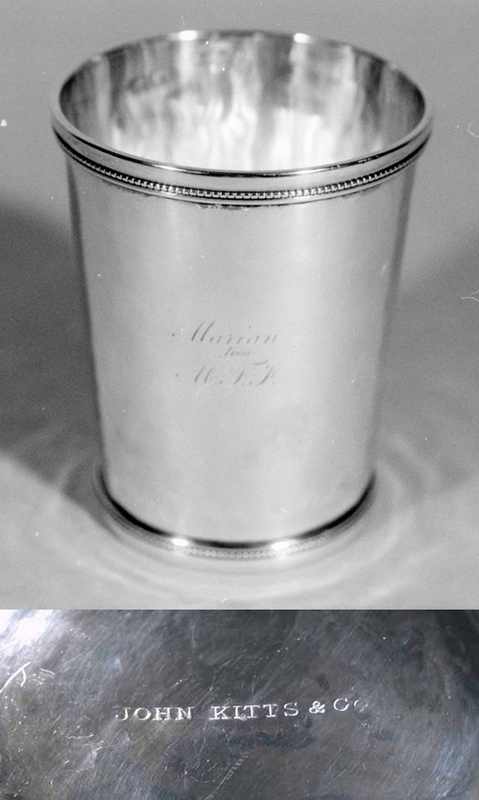 So are there less obvious examples out there of silver made elsewhere but marked and retailed in Kentucky during the nineteenth century? 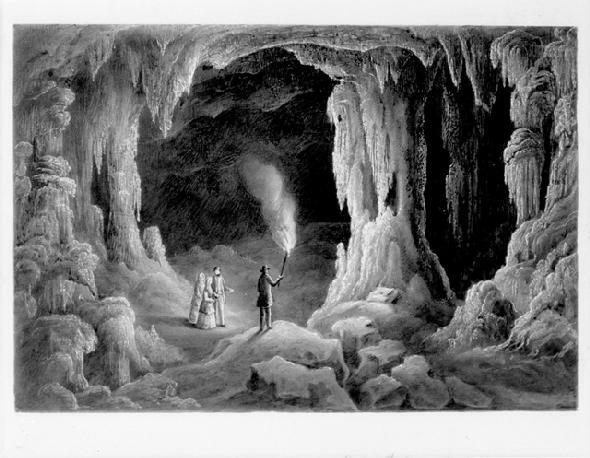 No doubt, pointing out the need for more research not just on individual artisans, but on the broader trade in silver. Get to work! You are currently browsing the archives for the Kentucky silver category.